MSNBCFormer White House aide Omarosa Manigault Newman appears on MSNBC’s ‘Velshi & Ruhle’ on August 13, 2018. 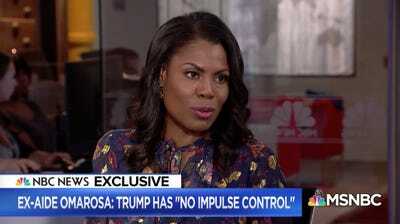 Former White House senior staffer and “Apprentice” contestant Omarosa Manigault Newman said no African-American senior staffers have been employed at the White House since her departure. “They’re making decisions about us without us,” she said in an interview with MSNBC on Monday. Manigault Newman’s memoir on her time as an adviser for President Donald Trump, “Unhinged”, is set to be released this week. Former White House adviser and “Apprentice” contestant Omarosa Manigault Newman said no African-American senior staffers have been employed at the White House since her departure in January. Manigault Newman continued by noting that every administration in recent history has had an African-American serve in an assistant role to a sitting president. Manigault Newman also said President Donald Trump’s administration does not care and has not tried to fill her position since she was fired in December 2017. Monday’s comments were not the first that Manigault Newman has made about the lack of African-Americans in the West Wing. After she was fired from the White House, Manigault Newman said the “lack of diversity” made her feel “very lonely” in the administration. “It has been very, very challenging being the only African-American woman in the senior staff,” Manigault Newman told ABC News in December. She has been on a media tear promoting her new book, “Unhinged,” which makes many claims about her time in the White House. The White House press secretary Sarah Huckabee Sanders said the memoir was “riddled with lies and false accusations.”Trump called Manigault Newman a “lowlife” in a series of tweets attacking his former director of communications for the Office of Public Liaison. 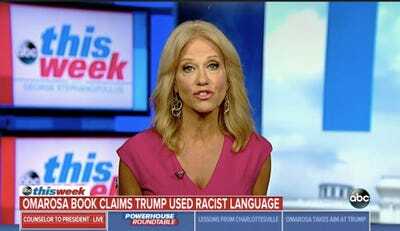 Screenshot via ABCOn Sunday, counselor to the president Kellyanne Conway dismissed the claims Omarosa Manigault Newman makes in her new book. Manigault Newman’s interview came just one day after counselor to the president Kellyanne Conway struggled to name prominent African-American staffers who work in Trump’s White House in an interview with ABC News. Host Jon Karl asked Conway for the name of any top African-American staffer since Manigault Newman’s departure. Conway pointed to Secretary of Housing and Urban Development Dr. Ben Carson, but Karl pressed her to name someone who works in the White House. Former White House aide Marc Short appeared on ABC after Conway and identified the staffer as Ja’Ron Smith, who he said works in the East Wing. Smith’s LinkedIn profile lists his title as Director of Urban Affairs and Revitalization. “(He’s) done a fabulous job and … he’s been very involved with Jared Kushner and President Trump on prison reform. He’s been there from the beginning,” Conway said, adding that he works in an office in the Executive Office Building. Manigault Newman’s memoir on her time as an adviser in the Trump White House, “Unhinged“, is set to be released Tuesday.